Saturday, October 27, 9pm. Municipal Theater Alameda de Tarifa. Free admission until cover capacity. The serenade is a musical form of enormous popularity in the eighteenth century and is characterized by its serene and quiet, hence its name, and the custom of interpreting it as a declaration of love. 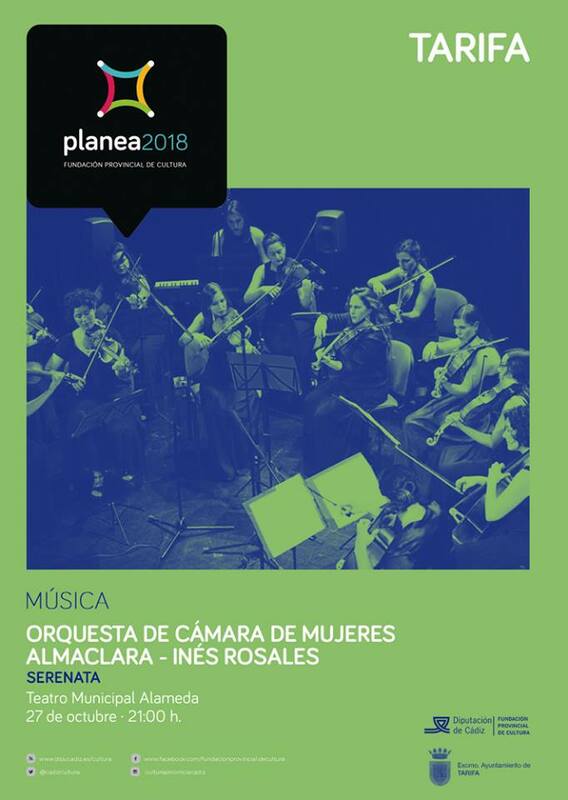 That is why the Orquesta de Mujeres Almaclara · Inés Rosales has wanted to include in this edition of the Almaclara Festival this concert program, premiered with great success in the summer tour of 2017. The proposed program includes the three great Serenades written for string orchestra, such as those of Mozart, Elgar and Tchaikovsky, which allow to deepen the technical and expressive resources that have marked this musical form, as well as the transformation that the instruments themselves Strings suffer depending on the different musical styles. Almaclara has a base of 15 string players with extensive technical and musical training, both at the soloist level as well as chamber and orchestra. Most of its members have been trained in the Orquesta Joven de Andalucía and in other orchestras of the national and international scene, with which they have played in countries such as the United Kingdom, France, Italy, Germany, Austria, Switzerland and Portugal. The high individual level of the components and their chamber music knowledge, the result of the experience of chamber groups of different dimensions, creates an energetic and dynamic ensemble, with a compact and homogeneous sound and with high technical and musical pretensions.